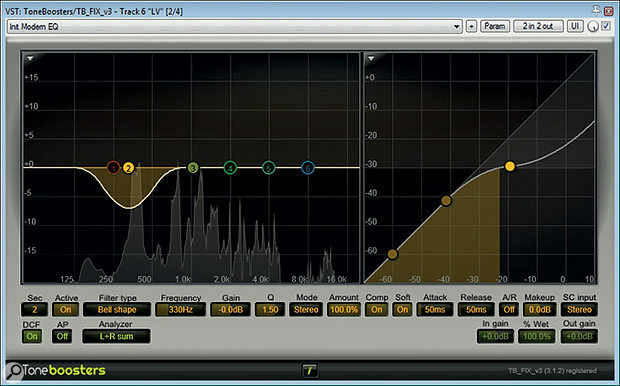 To counteract some variability in the degree of proximity-effect bass boost on the recording, Mike used a band of dynamic EQ from ToneBoosters' TB_FLX to compress with a soft knee at 330Hz. A little while ago, I was approached by singer-songwriter and vocal coach Michaela Betts (www.michaelabetts.co.uk) for advice on mixing a performance by talented young singer Alessia McDermott (www.belfieldandward.co.uk/actor/alessia-mcdermott). It was a recording of a simple piano plus voice arrangement which had come out of a vocal coaching session, and although Alessia had used a high-quality Bock 195 large-diaphragm condenser mic, the intention was always to re‑record her 'final' vocal at a later date. As is so often the case, however, there's no controlling inspiration, and subsequent efforts to capture a more refined version were frustrated — there was something special and unrepeatable about the original demo. The problem for Michaela was that she didn't feel she could quite get the mix sonics of this recording to compete well enough with songs of a similar genre — like Adele's song 'Hello', for instance. So she sent me over the raw piano and vocal tracks, and I loaded them into my Cockos Reaper DAW system to see what I could do. The vocal was overdubbed against the piano backing, so there was no spill at all between the two tracks, bar a small amount of headphone bleed that was insignificant in practical terms. Given that this was an obviously vocal-led production, I chose to start off with the singer's track in isolation, the aim being to get the best out of that first of all, and then fit the piano around it as necessary. The first thing I noticed was that there was a fair amount of rumble coming through the mic — not an uncommon problem outside the confines of a purpose-built studio space. Fortunately, it's something that's pretty straightforward to deal with using high-pass filtering. The main concern is judging the filter's cutoff frequency and slope such that it doesn't inflict too much collateral damage on the singer's tonal warmth, especially in arrangements such as this which take advantage of the kind of lovely smokey low-register notes that performers like Alessia can conjure up. The mic's close positioning played into my hands a little, as the cardioid polar pattern's proximity-effect bass boost had slightly overemphasised the low end of the vocal; losing a little of this emphasis to the high-pass filter was no great loss in the grand scheme of things. As such, the default 12dB/octave filter of Reaper's bundled ReaEQ plug-in set at 145Hz was perfectly adequate to achieve the necessary rumble reduction without excessively thinning the singer's low mid-range tonality. In the event, though, I chose to steepen the high-pass filter for a different reason. Whether because the singer was so close and on-axis to the mic, or because no pop shield had been used, jets of breath from a number of consonants were hitting the mic diaphragm to create strong low-frequency blasts in the audio signal. The most noticeable were on 'p' sounds, but there were also instances on some aspirated 'wh', 'h', and 'cr' consonants too. Now, this is obviously the kind of thing that's best tackled with adjustments to mic technique under normal circumstances, but it's also usually possible to fix retrospectively with high-pass filtering, just so long as the air flow over the diaphragm isn't so severe that it drives the input-chain circuitry into distortion or produces bucketloads of upper-spectrum turbulence noise. Luckily, the blasts here were primarily a low-end issue, so just steepening the high-pass filter to 24dB/octave was enough to address them.